Curug Gendang was the place that was historic enough for the struggle for the nation in the Dutch colonialism period beforehand. According to people's story around, the Nature Tourist Attraction (TWA) that at this time often was visited by good tourists local and these foreign countries could be used as the hiding territory of the heroes during warfare. Was in height 170 meter from sea level and far from the bustle of the city, the thunderous voice the waterfall that his spring came from the Pangajaran Mountain upstream was felt really enchanted. The waterfall be as high as 7 meter with the depth 13 metre and the area 10 meter that was in the area of the Carita Pandeglang Sub district named Curug Gendang. 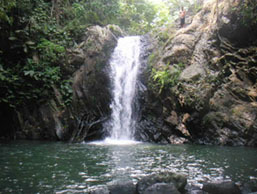 ‘Curug’ meant the waterfall and according to the inhabitants local belief, the fall voice of the waterfall was similar very much with the chubby voice or the drum. Then the waterfall that originally was named Curug Citajur was more known with the term of Curug Gendang.